No Apology by Mitt Romney, published in March, 2010, is the book I was looking for in the fall of 2008 so that I could evaluate the Romney governship of Massachusetts. He is a good writer and the book is filled with the detail I require when making a political evaluation. Unfortunately, Romney seems to be on every side of every question. I do think that his opinions and experience in Massachusetts on education and healthcare are important and deserve consideration when the discussion is about improving education and healthcare. I do not agree with everything he says, but I think that his opinions and experience are valuable. Like Tim Pawlenty in Courage to Stand, Romney wants the GOP base to select him as their candidate. Unlike Pawlenty, he offers details and his own views that occasionally conflict with the party line from the GOP and the TEA Party. 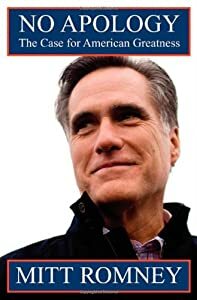 This book has increased my respect for Mitt Romney. My respect for him would be even higher if he had given stronger voice to his own views and less support to what the GOP base requires in its candidates. There are even occasional words of praise for Barack Obama.